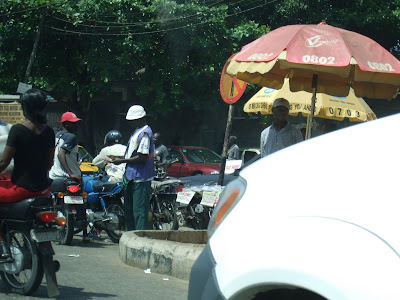 In the picture you can see one of the "area boys" attempting to extract a tax from one of the Okada (motorcycle taxi) drivers. I quizzed my work colleague on this yesterday and he laughed. The "area boys" as he called them are basically chancers trying to extort cash from the Okada drivers trying to make an honest living.